Scales with the basics: the comfortable column scales seca supra 719 dispense with complicated controls and concentrates on precise weight determination. It is easy to operate and therefore very user-friendly and ideal also for the professional sector. Further convincing features are the elegant, simple design, the stability and high capacity of the seca supra 719. High capacity, robust design: The seca supra 719 provides strength and stability which is reflected in the straight-line design and slim column. A large, robust glass platform makes the scales easy to step on. And, with its capacity of 180 kilograms, it is also suitable for weighing very heavy people. 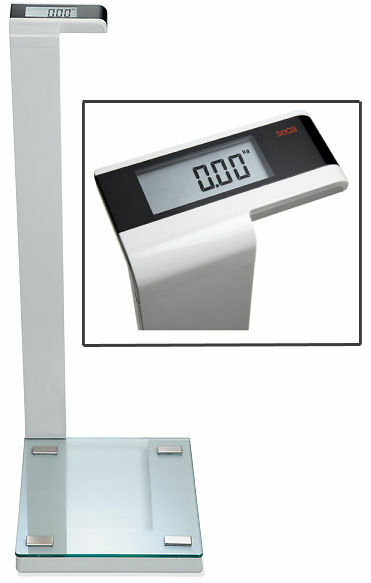 Step-off-function: With the step-off function, the scales are automatically reset to zero at every step, taking changes in the environment into account. When stepping down off the platform, the precise weight is automatically shown on the display. Superior quality for international use:The basic plastic construction and glass platform of the seca supra 719 are combined with stainless steel elements. First-class workmanship, with high-quality materials, guarantee a long life and particularly high stability. The column scales are easy and safe to transport. And, due to the integrated kg/lbs/sts switch-over, it is ideal for international use. The seca 719 is well-suited for fitness centers, hotels and private households. Four load cells made from brushed stainless steel.